Named after the Indian Goddess of Jewellery, Tulja is a family-owned business located in Green Street, a prestigious street in East London where every British bride of South Asian heritage dreams of selecting her wedding jewellery. Stocklist of Raymond Weil watches. Tulja stock high-quality, specialist jewellery which draws on South Asian heritage as well as modern design. Many of our pieces involve filigree work and have unusual and intricate patterns which are carefully and skillfully handcrafted. Tulja jewellery is manufactured all over India in cities including Bombay, Calcutta, Madras, Delhi and Rajkot and also by Indians living in Dubai. 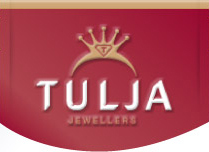 Tulja Jewellers is owned by Vijay Lodhia, his brother Paresh and their father Babulal. The family are descendants of jewellers in Rajkot in the Indian state of Gujarat, who expanded their business internationally in the early 1900s, sailing to Yemen, then moving to Khartoum, Sudan, and eventually to London in the early 1990s. Over the generations the business has diversified and expanded, and now Tulja are well known as specialists in wedding sets, including diamond jewellery and 22 carat yellow gold jewellery. We launched our Diamond Lounge in 1997 and moved from stocking just diamond rings to all kinds of diamond jewellery with our stones certified by gemmological institutes. Tulja caters for customers from all communities including Punjabis, Gujaratis, Bengalis, Pakistanis, Sri Lankans and other South Asian customers, as well as non-Asians.